“Crossing the border into Norfolk I saw my first pig farm and, until I spotted the almost invisible electric fence, I was impressed that they didn’t just wander off up the lane as there seemed to be nothing to keep them in. 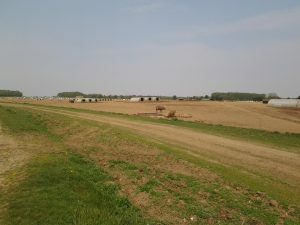 The dry bare soil extended almost to the lane with just a narrow, flat grass verge to mark the edge of their territory on the non-porcine side of the invisible fence. I’m sure that if they made a concerted effort they could have escaped but presumably regular food and shelter ensures their loyalty.